The first native-born black American to win a world title, Joe Gans impressed the boxing community with his scientific approach to the sport. Gans never moved more than a few inches to avoid a punch, studied his opponents' strengths and weaknesses much more intently than other fighters of the time, and directed his punches with pinpoint accuracy to key points of weakness. Gans' first-known boxing experience took place at the Monumental Theater in Baltimore when he won a "battle royal," a wild contest in which several black fighters entered the ring at once to fight until one remained. Gans's superiority in this brutal exhibition attracted the interest of boxing manager Al Herford, who directed Gans to a professional career. Gans started boxing professionally in 1891 in Baltimore. Over the rest of the decade, he compiled an enviable record of 58-3-6 with two no-decisions. In 1900, Gans, then 26 years old, faced Frank Erne for the world lightweight title. Erne peppered Gans with a blistering left jab throughout the fight, seriously cutting Gans' left eyelid. Realizing that to continue would risk blindness, Gans asked that the fight be stopped in the twelfth round. Gans spent hours analyzing Erne's style until he developed a strategy to counteract that murderous left. In their rematch two years later, Gans executed his plan perfectly and knocked Erne out in one round to recapture the lightweight title. Also in 1900, Gans met Hall of Famer Terry McGovern, who knocked him out in the second round after four earlier knockdowns. This match raised eyebrows as few believed Gans would fall to the wildly swinging McGovern. Later, Gans regretfully admitted to taking a dive in this fight. Never weighing more than 137 pounds, Gans often fought heavier men. He lost a fifteen-round decision to Hall of Famer Sam Langford in 1903 and fought to a draw with Joe Walcott in an attempt to take the welterweight title in 1904. Gans relinquished the lightweight title to fight Walcott, though in some quarters he still was considered the titleholder. In 1906, Gans met Battling Nelson in Goldfield, Nevada, in a fight arranged by Tex Rickard. Neither Nelson nor Rickard had much regard for black fighters. 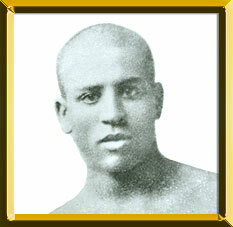 Gans, although he was the defending champion, was offered only one-third of the purse, and Nelson insisted that Gans make the 133-pound weight limit, rigidly enforced with three weigh-ins on the day of the fight. Gans knocked Nelson down a couple of times and each time helped him up. In the 42nd round, Nelson felled Gans with a low blow. The referee called the punch a foul and declared Gans the winner. Nelson knocked Gans out in the rematch to take the title, and then knocked Gans out again in their third meeting. At the time of his last two fights with Nelson, Gans already had begun to feel the effects of tuberculosis. He died from the disease in 1910.